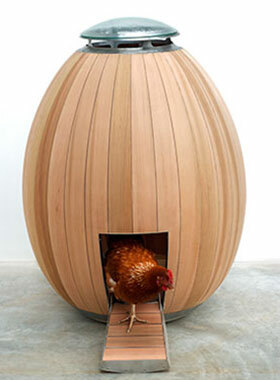 I just stumbled across this Urban Chicken Coop by Nogg and thought you might like this. If I was going to have chickens (would love to, but Dexter & Hercules … well, you know!) I would so get me one of these for them to live in. How cool and stylish is this?? The blurb goes … A stylish & sculptural piece of garden furniture with breakfast thrown in! Here is a review I found about it …. “The prefabricated chicken coop from British designers Matthew Hayward and Nadia Turan offers an alternative to the traditional chicken houses of yesteryear. 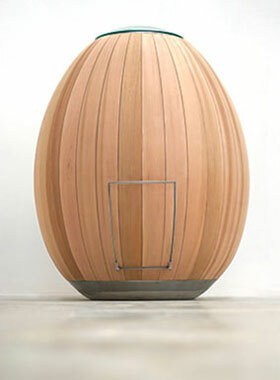 Dubbed The Nogg, the egg shaped chicken coop appears to focus on aesthetics over long-term functionality and practicality. Any chicken farmer, urban or otherwise, knows that the key to chicken health is a well-ventilated spacious coop that is easy to keep clean. The Nogg is constructed from locally sourced cedar and features a glass top for sunlight and ventilation“. This is one well designed coop. These would be some classy hens living here. Oh wow! My girls would be the envy of the neighbourhood if I had this in my back garden. Really nifty. I wonder how many chickens it would take – I’ll go and read about it. Thanks for the interesting post. Just shows you that you don’t have to stick to the ordinary – think different!